With several years of 3D movies development, it is quite easy for us to watch 3D movies in cinema. But if you stay at home, can you enjoy the great fun of watching the real movies? Or you may ask can i enjoy 3D movies with my Android phone or tablet? The answer is yes as long as you have an great android phone, an VR video player for android or 2D to 3D video converter for android, and VR Headsets like Samsung Gear VR, Oculus Rift, HTC Vive, PlayStation VR, Homido VR, etc. The 3D movies supported by most VR Headsets are Side by Side 3D or 360 degree video. Although there are many free video player for Android, however, you may be disappointed to find that even some advanced media players such as VLC or MXPlayer does not have the capability to play VR movie formats. So this article will share you 3 free VR video players for Android to help you better enjoy 3D movies on VR Headsets and a great 3D VR video creator tool – 2D to 3D video converter for android to get more 3d movie sources. VR Player is a powerful free VR player designed specifically to watch immersive content on head mounted displays (HMD). It can not only play VR video, but also play 2D, 3D SBS, 3D Top/Bottom, 360 degree videos. Although it has some performance issues with Oculus Rift DK2, it’s still a good VR player. You can download VR Player for Android here. The Total Cinema 360 player is a professional 360 VR video player that works seamlessly on PC/Mac to experience the optimized live-action 360° videos with VR headsets like Oculus Rift. Total Cinema 360 player supports 4K 360 VR videos, delivering immersive feelings for viewers together with the Rift. Plus, this 360 virtual reality video player provides VR 360 contents constantly. In addition to the desktop version, Total Cinema 360 also has 360 VR video player Android/iPhone/Web versions. AAA VR cinema is another great and free solution for android users. There is a wide range of options available to play 360 as well as normal 3D VR videos. The best thing about this VR player is the head tracking system. It is the most appreciated feature among the users. It is a great technology because the player tracks the drift movements of your head. Without the need of the Gyroscope sensor users can easily watch VR videos if you are having AAA VR app. This is simply amazing. The host of the feature has some more good news for the users and that is you can watch 360 degree playback, 180 degree panorama which the majority of the apps does not provide in there features. This player only supports MOV, MP4 and M4V format. You may need the best VR video converter if your video format is excluded. You can download AAA VR cinema for Android here. Do not have enough 3D movie source for viewing on Android VR video player apps or the online movie you downloaded from online sites does not compatible with the 3D movie file types supported by your VR video players, never mind, with our best 3D Videos Converter for VR Headsets – AVCWare 2D to 3D Converter for Windows/Mac, you can easily create SBS/TAB/Anaglyph 3D mode VR video with the format of MKV, MP4, AVI, WMV, MOV, FLV, 3GP, RM, RMVB, VOB, MTS, MXF, etc from common digital file formats for viewing with VR video player on various popular VR Headsets including Samsung Gear, Oculus Rift, HTC Vive, ANTVR, Homido VR, Google Cardboard, Zeiss VR One, View-Master, etc. And then you can watch kinds of 3D movies android phones or tablets like Samsung Galaxy S7/S7 Edge, Galaxy S6/S6 Edge, Samsung Galaxy A9/A8, Galaxy Note 8/Note 6/Note 5 and other Android devices,such as HTC, LG, Motorola, Sony, Google Nexus, Huawei,ect. 2D to 3D Video Converter for Android works on Windows 10, Windows 8.1/8, Windows 7, Windows Vista/XP. 2D to 3D Video Converter for Mac works on Mac OS X 10.12 Sierra, 10.11 EI Capitan, 10.10 Yosemite, 10.9 Mavericks, 10.8 Mountain Lion, 10.7 Lion, etc. 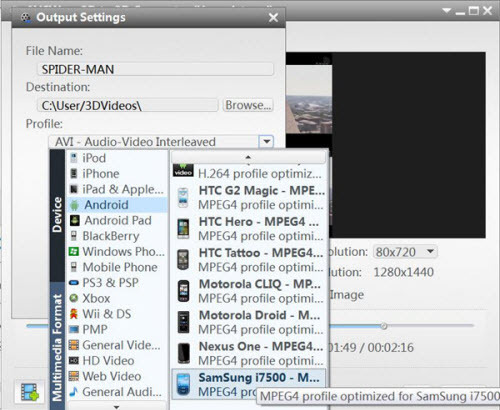 Free Download the 2D to 3D Video Converter for Android on Windows or Mac OS X a try now! Convert 2D to 3D Video: Convert standard video to 3D video. The 3D types can be Anaglyph, Side by Side, Side by Side (half-width), Top and Bottom and Top and Bottom (half-height). How to Convert 2D to 3D or Create 3D Video Effect with 3D Video Converter for Android? Run the 2D to 3D Video Converter on your PC or Mac, then click “2D to 3D” button to open settings interface. This 3D video converter program not only support outputting Red/Cyan Anaglyph 3D video format so you can enjoy 3D effect on a standard 2D TV, but also it supports Side-by-Side 3D and Top and Bottom 3D,please click “Anaglyph (Red/Cyan)”, “Side by Side”, “Side by Side (Half-Width)”, “Top and Bottom” or “Top and Bottom (Half-Height)” under the preview area,please select an output mode. Then setting the 3D Depth that you want to play in 3D. 1)You can drag the “3D Depth” control slider to set the depth. 2)Check the “Swap L/R Image” option, you can switch left and right eye’s image. 3)Click “Finish” to return to the main window. After finish setting the preferred 3D format,then click “Convert” button go to next step,the program will pop up a new output setting windows. In the output settings interface,you can see the program can help you convert any 2D video to 3D for iPhone, iPad, Apple TV, Android phones, Android Pad, TV/Mac/PC with 3D player and other devices.To convert 2D to 3D for Android devices,please click “Android” or “Android Pad” under the “Profile” options,then select the profile optimized for Android devices.You can also setting the output “video size” and “video quality” in this windows,then click “Ok” button start to convert your favorite 2D movies to 3D for Android. During the conversion process,please be patient until it done,it just takes you few seconds. How to Convert Video from 3D to 3D for Android? The 3D Video Conversion supports convert different 3D video format. Step 1.Click “3D to 3D” button to open settings interface. Step 2.Click “Side by Side”, “Side by Side (Half-Width)”, “Top and Bottom” or “Top and Bottom (Half-Height)” under the preview area, select a source mode. Step 3.Click “Next” button to return to next step. Step 4.Click “Anaglyph (Red/Cyan)”, “Side by Side”, “Side by Side (Half-Width)”, “Top and Bottom” or “Top and Bottom (Half-Height)” under the preview area,select an output mode. 1)Click “Back” to return to previous step. If you click “Remove 3D Conversion Settings”, then the 3D conversion will be removed. 2)Click “Finish” to return to the main window. Now,you have convert 2D video to 3D successfully, then just transfer the converted 3D video from computer to your Android phone or tablet,and enjoy 3D movies on your Android devices. How to Import 4K Videos to Adobe Premiere Pro CC/CS6/CS5/CS4?